I first encountered Star Control on the Sega Genesis. At the time, there wasn’t anything to indicate that it would eventually lead to one of the best computer games I’d ever play. Each ship had a primary weapon and a secondary fire mode which often affected the enemy’s mobility. For example, the VUX Intruder had a powerful but very short range laser. It’s secondary fire mode was to release slow-moving blobs that tracked its opponent and, when it made contact, slowed him down substantially. The Chenjesu Broodhome fired long range missiles that could be detonated remotely and had a secondary fire mode where it released a device which sapped the enemy’s power. The differing ships and weapons were not just graphical flourishes, but were significantly different. Choosing one ship over another had serious tactical implications. Around this core mechanic they wrapped a trivial strategic game, a sort of glorified 3D risk. Each of the races in the game was considered to be on one of two teams: the “Alliance of Free Stars” or the “Ur-Quan Hierarchy.” Players moved their ships through a hard-to-interpret rotating 3D map of star systems, and when two ships occupied the same system, they fought. If you think this mechanic sounds similar to the superb classic Archon, you’re right. And it’s no surprise. One of the principals behind Star Control was Paul Reiche III, who was partially responsible for Archon. Reiche also worked on the seminal (though flawed) Starflight series of games. Starflight involved exploring a huge galaxy filled with interesting and amusing alien creatures and a dramatic, intricate, and slowly-revealed plot. It was engaging and exciting in 1986, but many aspects of the user interface failed to stand the test of time. Star Control II starts with humanity defeated, crushed by the Ur-Quan Hierarchy, enslaved and confined to Earth. Through a series of fortunate events, you conveniently find yourself in possession of an immensely powerful alien vessel. You have just arrived in our solar system, and begin trying to find a way to free Earth and, y’know. Saving the Universe, at least initially, involves traveling to many uninhabited planets and mining them for precious materials. Along the way, you’ll find strange items. You’ll see wondrous celestial objects. And you’ll meet intriguing alien races who are by turns frightening, amusing, hilarious or irritating, and you’ll kill some of them. Your immensely powerful alien vessel can be used in combat, but if you lose it, the game ends. Fortunately, you can carry up to 10 smaller ships (with the aforementioned different strengths and weaknesses) to be used in combat on your behalf. This keeps combat interesting. 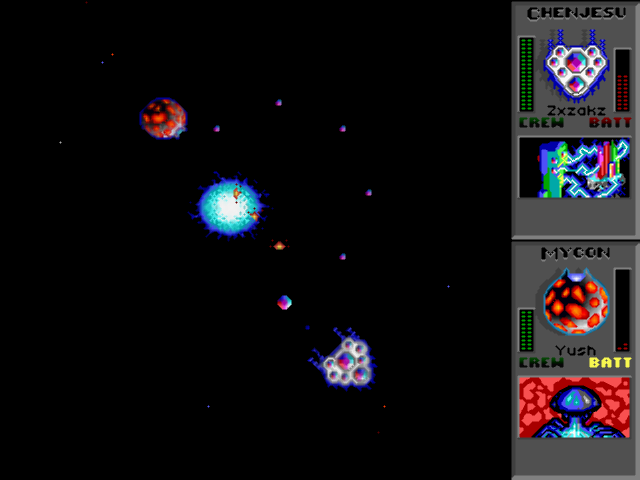 Combat isn’t, to my mind, the real point of Star Control II, though. The real point is talking to the aliens. It’s difficult to talk in detail about the aliens in Star Control II without giving away details which would spoil the plot. There are a wide variety of them, vividly realized in very simply animated illustrations and enjoyable dialogue. The conversation trees are not unlike those you encounter in Jade Empire, although they’re a little less safe. If you choose to be belligerent in the wrong place, the consequence could be losing a valuable ally in the war against the Ur-Quan. The Ur-Quan themselves are superbly-depicted bad guys. They look a bit like Cthulhu, but somewhat meaner. They’re highly intelligent, and highly motivated. This is one of the reasons I love the game so much. I love a game with enemies I can respect. The Ur-Quan aren’t evil. They’re just very, very motivated to prevent certain things from ever happening again, and have decided that conquering every sentient species in the Universe is the best way to achieve their goal. The writing is good throughout. It ain’t Dostoevsky, but it serves the tone of the game perfectly. The funny parts will make you laugh out loud, and the serious parts will make you think. The universe of the game is immense. There are just under 500 star systems, all of which can be visited, most of which have planets, sometimes many planets. Many of these don’t have anything to do with the main plotline, but the fact that they are there lends an open-ended feeling to the game that others have been striving (and failing) to emulate ever since. Yet the game is scripted such that it’s almost impossible for you to simply be a lost wanderer, not sure of what you can or should do next. If you decide to disregard the plot and go noodling through obscure corners of the galaxy, it’s because you are choosing to do so, not because you’re lost. In 2002, the creators released the source code to the 3DO version of the game as open source software. A group of dedicated fans took that code and created a fully-realized, multi-platform, OpenGL game called The Ur-Quan Masters (the Star Control name could not be used because it is trademarked). 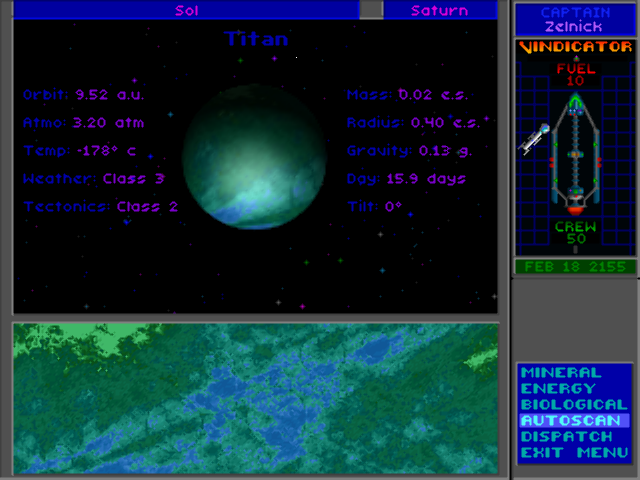 The game is available for Windows, Macintosh, and Linux. The original soundtracks are available for the game, as are the recorded voiceovers for all dialogue, which are quite good. This adds an extra dimension over the MS-DOS version that I played in 1992. There are 50 slots for save games. You can save any time you’re not in combat. You can play fullscreen, or in a window, at any number of resolutions. It works great.